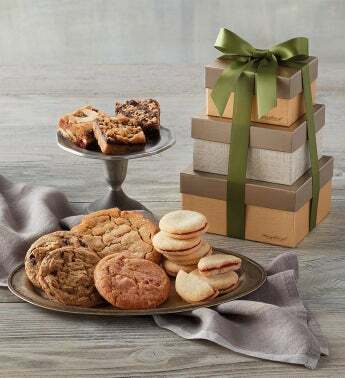 Show your appreciation for a client or colleague with this sweet tower of gourmet cookies. Three boxes are filled with buttery raspberry galettes, three flavors of chewy cookie bars, and more scrumptious cookies. It's all topped off with a hand-tied bow and is perfect for sharing for any occasion.